Joey Roth's ceramic computer speakers are just about the most gorgeous I've ever seen, and they sound amazing. But at $500, they're not for anyone who still thinks their MP3s sound just fine. His new speakers are at least as visually striking as his Sorapot tea kettle. The shiny cones are handmade from pure white ceramic, cork and light birch, with an included amplifier (with toaster-style volume control) made of sheet metal and cast iron. In case its $500 price didn't tip you off, this set is in no way a mass-market product, instead designed for that small minority of intense audiophiles who need great sound even at their computers. 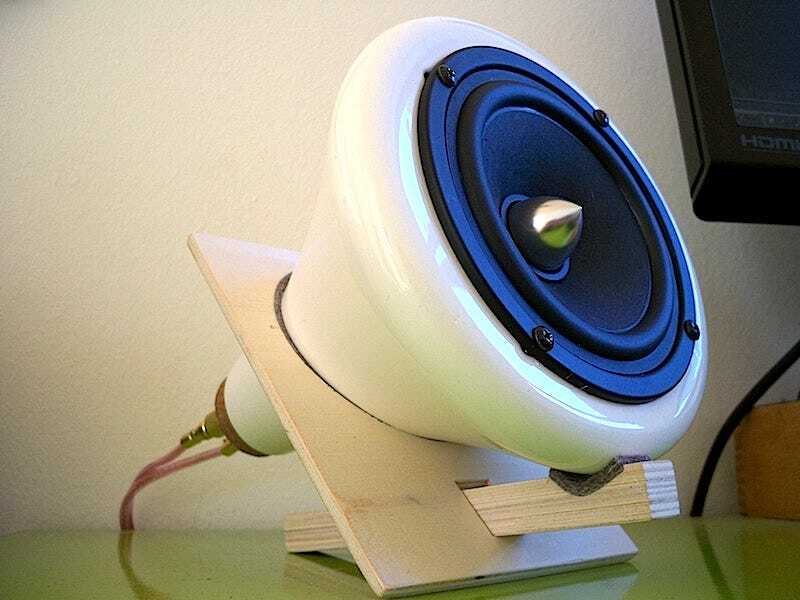 Both the ceramic and cork are "dead" in terms of vibration, unlike the more typical (and significantly cheaper) metal construction of other speakers, so the speakers themselves add no sound to your music. The stands, a Baltic birch plywood, hold the horns relatively firmly in place (they're sturdier than they seem in pictures) and look quite nice. Within Roth's creation lie high-end components. There are custom-made Tangbanb 4-inch drivers, the only of their type in this tiny size, rated at 15W per channel. The amplifier, based on the well-regarded Tripath 2024 T-Amp, features gold-plated binding posts and one 1/8" input (though he includes an interconnect for RCA cables). Also included in the package is 16-gauge oxygen-free copper speaker cables (the kind with banana plugs). There's no subwoofer—the set is trying to emphasize the mids, and to an audiophile like Joey, thumping bass of the sort you see in 2.1 sets throws off the balance of the music. If your eyes just glazed over reading that last paragraph, you're among the 99% of people for whom this speaker set is over the top. Don't worry about it—I'm in that group too. My high-quality MP3s played through a Zune HD sounded lifeless and dull, and the lack of a dedicated subwoofer was all too noticeable with the less-than-perfect encoding. But when I got into the sweet spot, and listened to Joey's high-resolution audio files, connected via his computer, the experience changed completely. The sound was far more subtle and nuanced than what I'm used to—I could even hear some vinyl impurity on the files he'd encoded from old records. It was almost off-putting at first, but it came with a warmth I didn't know was there. Mids were clearer than I've ever heard them, giving more emphasis to vocal harmonies, guitar and piano, and the overpowering highs and lows in lower-end speakers were noticeably downplayed. The hardware isn't perfect; it's handmade—apparently the ceramic cones are difficult to mass-produce—and sometimes it feels like it. The amplifier in particular looks a little messy with all the cables sitting out in the open (though Joey made it clear that that was a design choice) and the volume toggle feels a bit flimsy. It's not a plug-it-in-and-forget-it system, either: The EQ sometimes needs tweaking, and the gear is a bit delicate, so you want to take care with how you set it up. Still, the speakers themselves are heavy enough to stay put in their wooden cradles, and the 15 watts per channel were enough to fill the room with sweet music. The question is, will crazy audiophiles go for a low-power, lower-end (for them, at least) 2.0 system? They're certainly not made for household music listening, and they cost five times more than a typical 2.1 computer set. I can't think of a better option for audio nerds who spend a lot of time at their computers, but I still think this will remain quite a niche product. If you're in that niche (and have $500 to spare), they're are available for pre-order now from Joey's site, in a limited first run of 200 that will arrive in early November.